Growing up a native St. Louisan, I was taught to crochet and hand embroider fine linens when I was ten years old. By thirteen, I enjoyed designing and sewing my own clothing and gifts with fine hand and machine sewing. As a parent with two sons, I enjoyed designing my own draperies and curtains becoming acquainted with the fiber arts — especially vintage laces. In 1992 I became a porcelain doll artist in the specialized art of doll making for clients interested in recreating a doll in the image of themselves as a child or as their parent as a child dressed in the style of that era. I have studied tailoring, picture smocking, French heirloom sewing by machine, and fine machine embroidery producing various gifts of original design. I have loved creating fine handiwork of the finest fabrics in the world – English lawn, Swiss and French laces, and linens from Egypt, India and Belgium. In 2002 I became interested in creating totes and handbags of natural fibers as a means of enjoying beautiful embroidery and vintage laces in my daily life. Weaving baskets of reed has come naturally to me as a means of incorporating a heavier fiber into my creations. In 2004 I was introduced to the lost art of Shaker basketry using hand-pounded ash from the New England brown ash tree which my expert teacher had chosen, split, sanded and cut in the same fashion the Shaker community did 150 years ago. Shaker baskets are woven on special mold replicas found only in Shaker museums today. The experience of weaving with this hand-pounded ash is profound – very similar to sewing with the very finest satin. My husband, John, and I have brought the lost art of hand-pounded ash to St. Louis to create the finest weaving material possible. 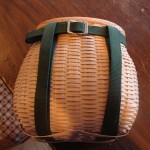 We enjoy sharing the art of Shaker basketry through classes and creation of original purses and totes with custom liners.